Trans-Siberian Rail Road is one of the most recognizable Russian brands as it is the country’s largest railway artery. 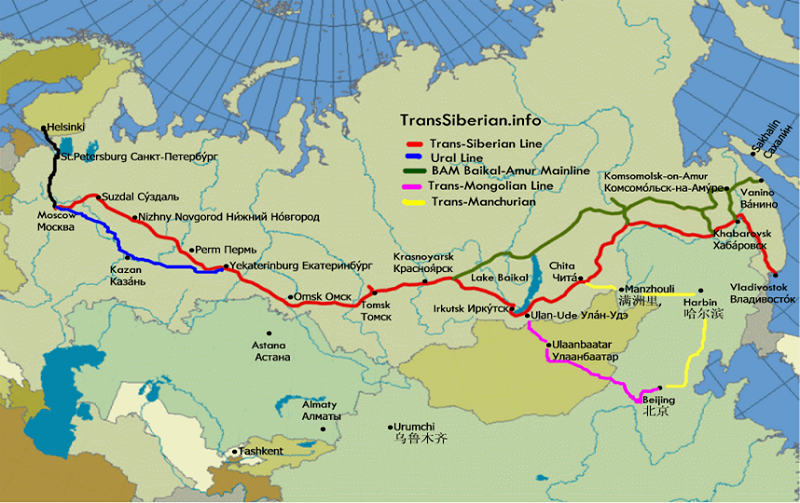 The Transsiberian Railway is the railroad line which connects the European Russia with Siberia and the Far East. Its historical name is “The Great Siberian Way”. The term “Trans-Siberian Railway” literally means “passing through Siberia” (Trans-Siberian). This name has been given by British, has got accustomed and taken roots. This Trans-Siberian route from Moscow to Vladivostok is one of the world’s famous journeys and is, perhaps, one of the best ways to get acquainted with the country, realize true scales of Russia and discover the county’s history and value. This trip is not for those who just go from point “A” to point “B” by the longest railroad of the world. It is for those who want to realize the participation in one of grandiose human creations, the Great Siberian way. This world’s longest railroad connecting two continents has been built in record time period and has struck contemporaries with innovative engineering decisions. The construction of Transsib started in 1891 and it was completed in 1916. At the beginning of the 20th century the train trip along the Transsib would take 16 days and 6 hours. Now the non-stop journey on the transsiberian route will take only 6-7 days, but they will be extraordinary eventful. Less than in a week you will put your clock on seven times, because you will pass through 8 time zones and you will pass through more than 20 regions of Russian Federation. The Central Russian landscapes will be replaced by the Ural Mountains behind which boundless open spaces of Siberia are stretching. You will go along the coast of Baikal Lake, cross 16 large rivers, rise by more than 1000 meters above the sea level. The extent of the Trans-Siberian Railway on the main course is 9 288,2 km. It passes across two continents: Europe (1777 km) and Asia (7511 km). 87 cities are located along the Trans-Siberian Railway and 5 of them have population of over 1 million people: Moscow, Perm, Yekaterinburg, Omsk and Novosibirsk. The starting point is the capital of the Russian Federation, Moscow, at the Yaroslavsky railway station. A mile stone “zero kilometer” was erected at the Yaroslavsky station. Another memorable column is a sign on the border between Europe and Asia at 1778th km at Pervouralsk. The third one, topped with a double-headed eagle was established at 3336th km of the road, in Novosibirsk, the megapolis which is given rise by the Trans-Siberian Railway. The fourth mile stone is the most impressive kilometer column, made from cast iron and with a double-headed eagle, was put up at the last 9288th km in Vladivostok. 16 large rivers are crossed by the Trans-Siberian Railway: Volga, Yenisey, Ob, Kama, Amur, Irtysh, Ob, Tom, Chulym, Selenga, Zeya, Bureya, Vyatka,Tobol,Chorus and Ussuri. The bridge over the Amur River is the biggest on the Trans-Siberian Railway and in Russia now, it is 2612 m long. Other long bridges over Kama (945 m), Yenisei (934 m), Ob (820 m), Irtysh (734 m) and other rivers are impressive as well. Totally there are 15 tunnels on the main course of the Transsiberian railway. The longest tunnel is connected with the Amur river. It was constructed under the river as a doubler of the railway bridge in 1941. Its length is 7198 m. The longest overland tunnel is Tarmanchukansky (2030 m long) which was constructed in 1915. The Trans-Siberian Railway runs along the coast of the Lake Baikal for over more than 200 km. This is the unique deepest lake in the world as well as the largest reservouir of fresh water on the planet. In front of Vladivostok for 39 km the railroad runs along the coast of Amur Bay. It is the lowest part of the Transsib way. There are two more railway lines branching off from the Trans- Siberian Railway: the Trans-Manchurian line, which goes to Chinese cities such as Harbin, Changchun and Beijing; and the Trans-Mongolian line, that goes towards the capital of Mongolia, Ulan-Bator. So after covering thousands of killometers by train across the Russian Federation the tourists may continue their trip to Mongolia and/or China.